So, when we last left you my friend Andy and I had just made it back from climbing the Grand Teton in a day. Needless to say we woke up the next day pretty haggard and hurting. But, after being cooped up in an office for the majority of the summer I wasn’t about to throw in the towel just yet. We said goodbye to George, our climbing ranger compadre, as he was getting ready to chase down a couple of model citizens who were hunting elk with bows…while high on meth…in the park (I’m not kidding). 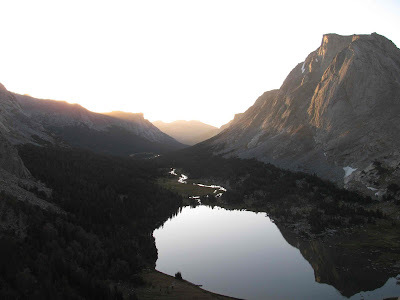 I didn’t envy this particular job requirement and couldn’t really think of a good way to way to go about accomplishing this task, so we left this incredible park and drove south to the Wind River Gorge and into the Cirque of the Towers. The drive went fast and soon we had our bags packed and ready to go. 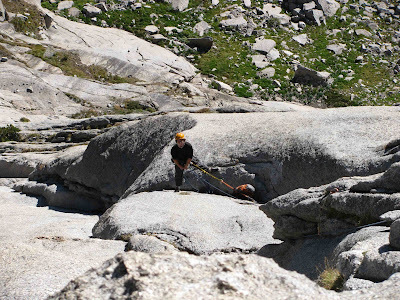 I couldn’t believe my eyes; we had packed five days worth of food, supplies, and climbing gear into two 50-liter packs. After a quick stretching session to loosen up our sore legs and backs we hit the trail. 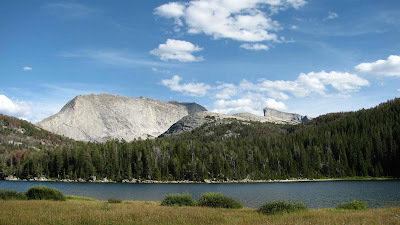 The first 6 miles to Big Sandy Lake went quickly and soon we were climbing toward Jackass Pass and the alpine playground that is the Cirque. Before long we finally caught sight of our objective, Pingora. 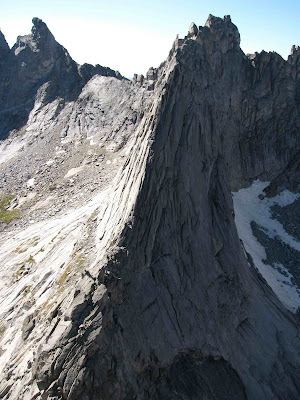 This tower dominates the Cirque and had been sneaking its way into my dreams ever since this trip was drawn up. 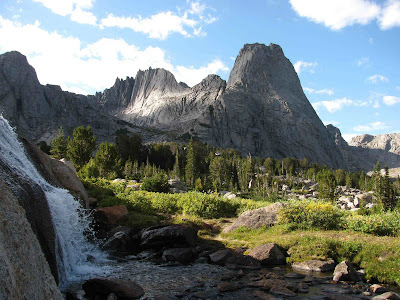 To finally see this incredible peak gave me a second wind and I found myself trotting along the trail, barely aware of the heavy load on my back. When we arrived in the Cirque itself I had to pinch myself. 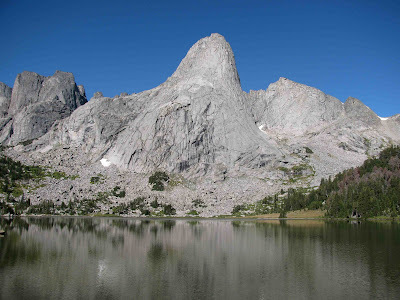 Surrounding us were huge, towering pillars of beautiful rock, jutting up from serene alpine meadows, teeming with countless streams and ponds. 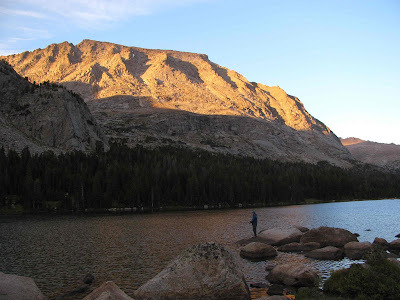 We found a suitable camping location above Lonesome Lake and quickly pitched our tent. We excitedly packed our bags in anticipation of the early start the next morning. Sleep came easy considering that in three days we had driven from Bellingham to Jackson, climbed the Grand, then drove to the Wind River and hiked 10 miles into the Cirque. Andy and I both woke up early the next morning with very annoyed bodies. My calves felt like they had gallons of lactic acid built up inside and the rest of my body didn’t feel much better. We contemplated taking a rest day but the weather was supposed to be perfect today…and we were just stiff from sleeping on the ground all night, right? It wasn’t too difficult to convince ourselves that we were right and we threw on our packs and started the approach. We spotted a long line of headlamps on the opposite side of the lake and cursed ourselves for not waking up earlier, as these headlamps seemed to be headed for the same route as we were, the Northeast Face of Pingora. Everywhere I read stated that this route had become incredible popular ever since it was featured in the 50 Classic Climbs of North America. We picked up the pace hoping to beat the large group to the base of climb, but fortune was on our side that morning as they headed up a different trail and disappeared into the darkness. 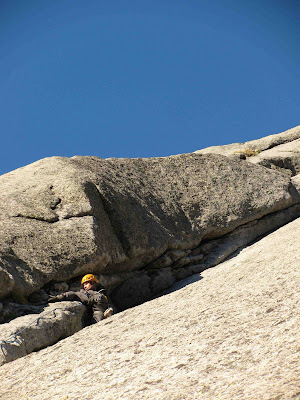 We made it to the base and found ourselves alone, with only a massive face of solid granite above us. We traversed over to the start of the vertical pitches and were soon greeted by the sun as it rose above the valley to the east. The weather was perfect, no wind and just the right temperature. The climbing was some of the best I had ever experienced. The pitches blended together in a wonderful swirl of incredible cracks, warm sunshine, gentle breezes, and breathtaking scenery. There is nothing about this climb that I didn’t enjoy. 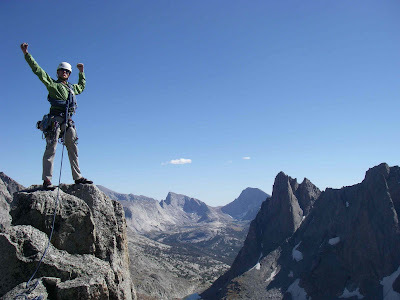 Every belay ledge was perfectly situated and you could just climb and climb and climb until you were almost out of rope. We moved over the stone with giant smiles on our faces. We were the only one on the route the entire day, this classic line was all ours. It was almost a shame to make it to the summit; a wall that good should never have to end. But, what a summit it was! We got to see the entire Cirque wrap around these lush alpine meadows and caught glimpses of the other peaks littering the Wind Rivers. We were able to get a perfect view of the other objective we had in mind, the East Ridge of Wolf’s Head. That route would have to wait however, as the day we planned to climb it we woke up greeted by dark clouds, high winds, and snow flurries. Not the best conditions for the thin ridgeline and exposed traverses that make the route so appealing. The descent back to our camp went quickly and we basked in the remaining sunlight by Lonesome Lake, only getting up to take shifts fly-fishing in an attempt to catch ourselves a delicious celebratory trout supper. Needless to say we enjoyed a fantastic feast of dehydrated mashed potatoes and oriental noodles that evening. 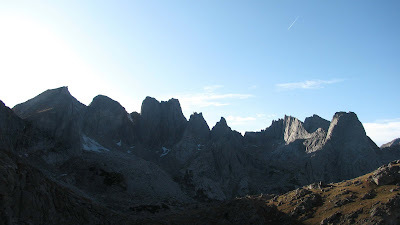 The Cirque of the Towers hold a special place in my heart now and I am counting the days until I am able to return. Boy am I glad I didn’t go back to sleep that morning!